This entry was contributed by Willow Jacobson on October 23, 2015 at 7:30 am and is filed under Collaborative Leadership, Group Process, Tools and Practices. Public sector projects are complex projects often involving staff across multiple departments and may require access to professionals that are external to the organization. Projects can range from creating an internal newsletter, revising policies, acquiring and redeveloping a property for economic development, or creating a new outreach project. These projects, with their variations in size, stakeholders, and complexity, all share in common that they must contend with issues of scope, time, and cost. Success will undoubtedly require “project management” skills. The term “project management” evokes images of highly specialized private sector project professionals working in project-based industries such as engineering, power, pharmaceuticals, and tech companies. Can a project manager at a local government or nonprofit agency employ “project management” principles, too? Absolutely! Regardless of the organizational structure, project management has a place in all public organizations because management of projects has become a powerful way to integrate organizational functions and motivate groups to achieve higher levels of productivity and performance. This post describes the core principles for successful project management and why they are important to effective project management. A project is simply a temporary effort, undertaken to create a unique service or result. It has a beginning and end. 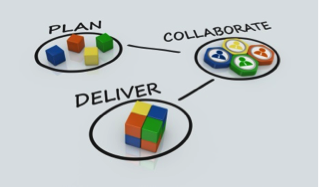 At its core, project management is about creating a structure to manage a process to achieve a project objective. A project manager is responsible and accountable for setting realistic and achievable goals for the project and for leading the project team to complete the project. The organization needs to explicitly give the authority over the project and its personnel to the project manager. This is increasingly important when those people serving on the project team have several lines of authority and the project is only one piece of their day-to-day responsibilities. For example, a project aiming to produce a new comprehensive vehicle policy for a municipality may include team members from the police, fire, public works, and finance departments, as well as from the manager’s and the attorney’s office, all of whom directly report to different managers. In this situation, the project manager needs to have a strong communication plan in place with the functional managers of the project team and must ideally have final decision-making authority within the parameters of the project. Project management employs a ‘project framework’ that can be applied to any number of projects from creating a vehicle policy to a revitalization plan. The framework is built upon a set of key knowledge areas that address ‘facilitative functions’ and ‘core functions’. By outlining and considering these items in advance the project manager will start the project better equipped to move things forward. Understand the difference between “facilitative” and “core” functions (you need them both). The facilitative functions are about coordination, support, and communication—keys to getting the right people, right funds, and right processes in place. For example, in the case of a new vehicle policy how will the right team be identified (should it be people from departments with the greatest use of public vehicles or people that monitor and budget for use- most likely it is both) and how will you ensure team members are engaged? Additionally, how will communication be coordinated so that all team members are getting and providing all the needed information in a timely and efficient manner (and if this is in the form of meetings how will employees like fire who work shifts be impacted by this decision)? The core functions involve establishing the parameters to effectively control the project in terms of issues such as defining the scope, cost, and time. Both functions are important for project success but also involve different skills. For example, how the project is defined and how long is needed for completion? What will be the direct and indirect costs that need to be budgeted for the project and who is footing the bill? Finally, how will the team respond if the scope of the project changes? This entry was tagged with the following terms: collaboration, collaborative leadership, project management, teams.